I am fairly certain that I have not donned a costume for Halloween in at least 35 years. This particular celebration, while fun as a child, never really found a foothold in my heart. Add to that, in Christian circles, Halloween was disparaged as “Satan’s high holy day” – something to be avoided as avidly as cursing or reading Harry Potter. Tonight it occurred to me that little about the rituals and celebrations of Christianity ever took hold in me either, despite spending 30+ years in that paradigm. Granted, as a child, Christmas was the most wonderful time of the year, to borrow a well-worn lyric. Certainly my parents and their tradition of Santa Claus helped (I can still remember my father peeking into my bedroom to ask if I had heard the sleigh bells – his voice was as filled with wonder as my child’s heart! ), but even later on in my teen years, I remember sitting in our living room mesmerized by the glowing coals in the fireplace, while white lights twinkled between evergreen boughs laden with ornaments and tinsel. Sometimes when I think about what peace feels like, that is the picture that comes to mind. Over the years, Christmas came to mean less and less to me – especially once I understood that December 25th was not the birthday of any deity in the flesh, much less Jesus of Nazareth. In the early 2000’s I stopped putting up a Christmas tree, and have been hard-pressed to find ways to create meaningful traditions for myself or my family ever since. Anyway, every Christian holiday is nothing more than a hijacked pagan celebration of one kind or another. In 2006 I began what turned out to be a 10-year trek out of my Christian faith. Not that I am an atheist per se. I believe – probably stronger than I ever did as a Christian – in the absolute existence of a spiritual dimension. I am certain that death is not the end. But the job of determining whether there is a personal god out there running our universe is beyond my pay grade, the purview of religion, and better left alone by li’l ol’ me. Perhaps because of my recent fascination with the Celts, faeries, and magic, I have gravitated most towards the old religion or what many call paganism. Admittedly, my stint in Christianity has caused me to shun any and all religious traditions, especially those who claim to know ‘the way’ or ‘the truth’. But the seasons of the year and of life are something I am familiar with. And I have always had a special affinity for the moon. That is the other strong memory I carry from my teenage years: monthly chats with the man in the moon. I had a perfect view of the moon at its full from the swing in our backyard, and I have always been able to see a face on the surface of it. In fact, I am hard-pressed to look at a full moon and not see a face. At the same time that I find myself drawn to the cycles of the moon, I also feel a renewed sense of connectedness to the earth. I do desire to establish traditions to follow, but I am content to move slowly, listening closely to my own heart and what it whispers about the lessons, comfort, joy, or depth that a particular holiday celebration can lend my spirit. I began following the full moon cycles sometime in 2015, and this year added the new moon cycles to my monthly observances. Late in the summer, I determined to celebrate as many of the eight pagan festivals (beginning with Samhain, pronounced Sow-en) I am able to this year. October 31 marks the end of summer, the last of the harvest celebrations, and the beginning of the new year for the Celtic pagans of old. 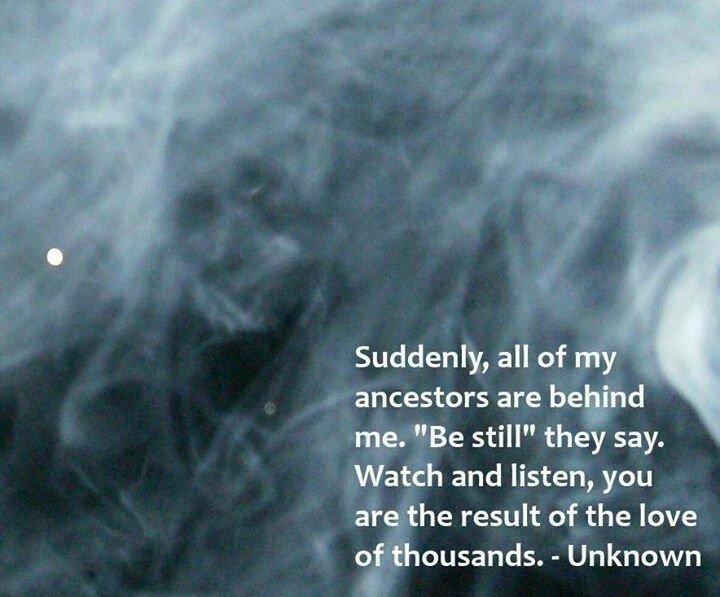 Samhain is a time to give attention to our ancestors and other loved ones who have passed. Many see it as an opportunity (perhaps even an obligation) to learn about their heritage and honor dead loved ones in some fashion. Still others believe that the veil between our world and the world of the dead is thinnest on this night, making possible communication with those who have passed. For me, I wanted to take some time to think about how those family members who have gone on affected me while they were here. To that end, I put together a display of photographs, peppered with candles, fresh flowers, and crystals (particularly those related to the root chakra) on my buffet. My Tree of Life Grid has never held as much significance for me as it does now – a lovely reminder of my life, my roots, my heritage. I started the process the first week of October and did not complete it until this past Friday. I took my time, and thought through the many photo choices, discovering a couple of folks whose legacy I found myself unable or unwilling to honor. They are not on display this year, but perhaps I will come to terms with them enough to include them in future. Through this process, I began to think about the legacy that I want to leave behind. I even asked myself what kind of legacy would be left should I pass today. Sometimes I wonder if the reason many of us throw our lives onto the wide screen of the internet is in hopes that something we say, do, write, or photograph will touch enough random people that our legacy may somehow live on after we pass. Perhaps it is our way of dealing with the fact that death comes to us all. We as a society have certainly invented many ways to avoid ever thinking about our own death, yet that is precisely why we remain haunted by the prospect. Last night was the new moon, a black moon (by definition, the second new moon in 1 month). Tonight begins Samhain, the Day of the Dead, and tomorrow the Wheel will start to turn anew. The near overlap of the black moon and the beginning of a new year holds special significance for me. I have learned that new moons are a good time to set intentions for the coming months. Since this was a rare black moon so closely connected with the start of a new year, it became a time for me to consider what I would like to see in my own life in the coming months. As I reflected on my day, I realized that it was filled with exactly what I want for the coming year: meditation, healthy eating, work, writing, and loving encounters. A good omen for what is to come, I think. Whatever your tradition, Halloween, Samhain, or All Saints Day (November 1), may you find comfort in your roots. May you come to understand the legacy your ancestors left behind. May you honor that legacy, and learn from both the victories and mistakes of those who precede you. Above all, may you find comfort in knowing who is watching over you, and who waits for the joyous reunion to come. Fascinating post! Really enjoyed the journey you’ve shared.